At this point, you may be wondering what tacos have to do with the cloud, with Veeam or with anything at all. 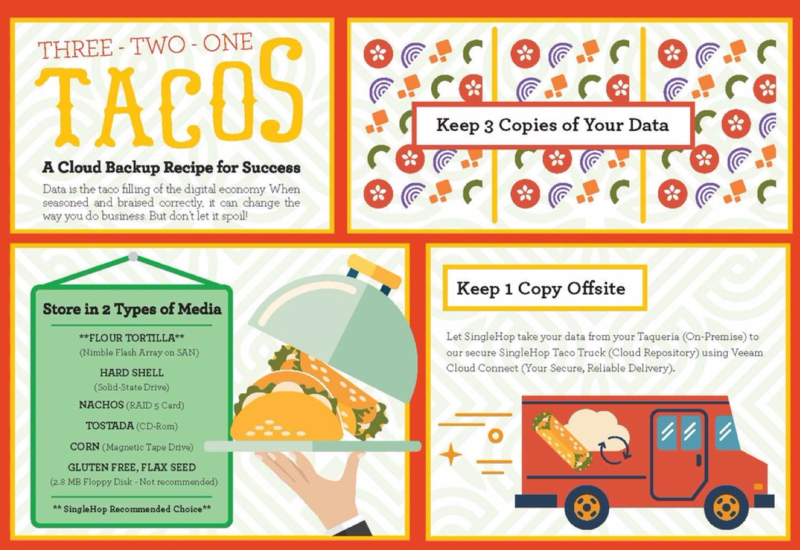 But don’t fret—we came up with a little taco recipe to show you how Veeam protects data in the cloud using a Cloud Service Provider. But enough about tacos! VeeamON 2018 also brought us some product announcements, educational sessions and market updates from the Veeam team. Here are the SingleHop team’s top takeaways. This year, Veeam pledged to go beyond its traditional mantra of “Always On availability”, introducing “Hyper-Availability” to the enterprise. These new Veeam products and services will enable organizations to evolve from traditional policy-based data management to a more behavior-based system of Intelligent Data Management. 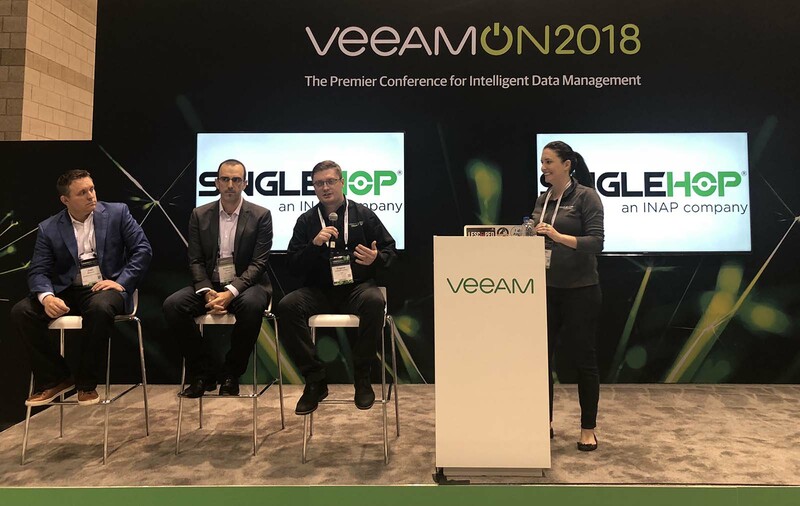 During his session at VeeamON 2018, SingleHop’s very own Eugene Kashperovetskyi highlighted how to best utilize the power of Veeam ONE to proactively monitor not only Veeam but any other virtualized infrastructure in your environment. Veeam ONE provides deep, intelligent monitoring and reporting for your entire environment, delivering the dashboard and intelligence reports you need to maintain and manage consistent Availability. Veeam also announced its new Veeam DataLabs feature set, which will be in both its Availability Suite and Availability Orchestrator. DataLabs is a combination of critical application backups and network configurations that provides a safe environment for testing, audits, analytics and simulation, all of which will enable Veeam customers to dive more deeply into Intelligent Data Management. 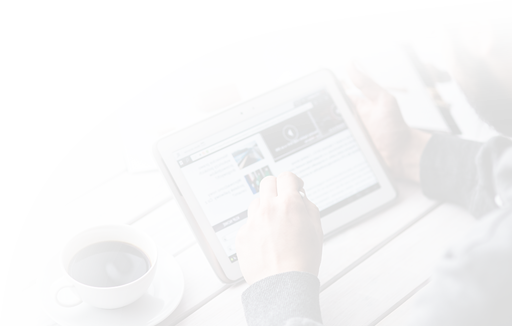 The new version adds protection for Microsoft SharePoint and OneDrive, as well as major ease-of-use and backup flexibility improvements in a newly redesigned job wizard that makes setting up, searching and maintaining visibility into your data easier than ever. Ransomware was one of the biggest topics of VeeamON 2018, and for good reason: The number of ransomware threats has grown tremendously in recent years. The session dedicated to discussing ransomware and how to deal with it had some great tips on protecting data, namely the 3-2-1 rule (see our handy infographic above).